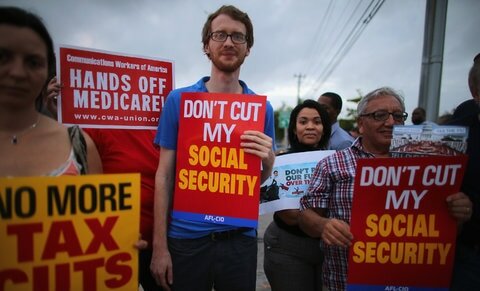 When Social Security cuts in my weekly paychecks were first imposed upon me as a vigorous and healthy young man in my late teens I was opposed to it. It was in the late 1950’s and I was working for about seventy-five cents an hour in those days. That weekly cut from my pay seemed harsh. I remember calculating that simply putting a modest portion of my earnings into a savings account drawing interest at the local bank every week for my working life would be more than enough money to retire on. Who would have dreamed that inflation would have run so rabid during the years that I lived. My wife and I lived comfortably well on the money we earned in those early days. We could buy a new car for $800, our first house; a two-story three bedroom place in a nice neighborhood was purchased for $21,000. Gas was just 23 cents a gallon. A dentist would fill a cavity or pull a tooth for $30. A doctor visit usually cost about $8. I quit smoking after the price of a pack of Chesterfield Kings rose from fifteen cents to a quarter. During all the years that we worked our employers faithfully took cuts for income taxes and social security from our checks. We groaned about it when we took time to notice, but knew there was little that we could do about the loss of that earned income. The taxes in effect went wherever our elected government leadership deemed it necessary to use it. Most of the time we were happy that it went into building good roads, sewer systems and maintaining a military to keep us safe on the home front. The Social Security money went into what we were told was a separate account to be used for our retirement. It was a formula dreamed up by the Democratic Party during the Great Depression and designed to make sure that the elderly citizens could always maintain a living after working until the age of 65. After we reached retirement age we came to understand the wisdom behind the Social Security program. We discovered that with two Social Security checks coming in every month, my wife and I were still able to maintain a comfortable existence even though the price of everything had, by then, gone through the roof. I remember the first time I paid $100 for a cart of groceries. My cart was stacked and people in the store commented on how much food that much money could buy. Now $100 barely buys enough for two people to eat for a week. People pay more than we did for our first house to buy a modest vehicle. A decent house today costs over a million dollars. Rent payments can run up to $2,000 or higher a month. The odd thing about Social Security, however, is that the “adjusted” monthly payments, calculated on a formula called COLA which is supposed to allow for yearly inflationary price increases, has not kept up with the real increase in the cost of living. We are always getting a big yarn from Washington about how the overall cost of living was remaining stationary in spite of what we were feeling in our pocketbooks on the home front. Those words remind us of the infamous quote "Let them eat cake" allegedly muttered by French Princess Marie-Antoninette when told of the disgruntled populous. And we all know what happened in France and to Marie-Antoninette after that. In the U.S. we had jobs. We worked hard for the years we were allowed to work. We were forced into retirement by our employers and forced by law to accept and live on the established Social Security and Medicare programs. We found them adequate at first, but as prices rocketed, and medical bills accumulated, the money we had was never enough. Conditions since those first days of retirement have been getting increasingly worse. I heard a corporate boss explain once that Social Security was originally calculated to take care of workers for about two or three years after they retired. That was because the average age of a worker in the U.S. was about 67 or 68 years of age. But because of better medical and health practices, a lot of seniors are now living to be Centurions. And this man said, our healthier living is putting a huge drain on the Social Security program. That was a lie. There was always ample money in the Social Security program to maintain a great retirement for Americans for years into the future. But former President Ronald Reagan, the first of a line of swindling Republicans who moved into office, found a way to “borrow” an estimated $2.76 trillion is surplus Social Security revenue in 1983. George W. Bush was said to have "borrowed" over a trillion more for his wars in the Middle East. That form of embezzlement has been secretly going on ever since Reagan and the money has never been paid back. Instead we are being told that because more retirees are living longer and there are fewer post-war children now on the work force, the program is running out of money. This year the benefits for over 60 million Social Security recipients were increased by just 0.3 percent. It was the first “increase” approved for the elderly in at least five years. The increase, which amounted to a raise of about five dollars a month, was eaten up in increased premium payments for those receiving Medicare Part B which covers doctor and outpatient hospital visits. Most seniors want this insurance because they go to the doctor more often than when they were younger and still healthy. And a doctor visit can today cost upwards of $400 or more. So for them, there was no raise at all. I read one statistic that stated: “45 percent of retirees spend more than one-third of their Social Security benefits on health care, from co-pays for care, to premiums, deductibles and out-of-pocket fees for services – such as going to the eye doctor, dentist or audiologist – that are not provided.” These are among the costs to seniors that are cleverly overlooked by COLA when calculating the average cost of living increases for the nation. How are the seniors coping? Some are working if they can find jobs. Others who are living alone after losing wives or husbands are being forced to pare off and move in together just to combine their limited Social Security income. Others are going without badly needed medicines, eating low-priced and unhealthy diets and freezing to death in unheated homes. Many are unable to handle high rent payments and forced to move in with their children or accept badly maintained nursing homes. Many are coming to early and unnecessary deaths. The problem was not poor planning on the part of the socialist system established by the Democrats in the 1930's. It has been big corporate greed and cold-hearted people in political position who have not given a damn for the welfare of the nation’s people.